I rock. Hey, you said it. I saw them last night at Le Poisson Rouge, as they were the opening act (the main act for me though – I only went for them! ), and they were SO GOOD. They opened with the title track, “There’s a Difference”, and then went right into my FAVORITE SONG EVER, “Say It Out Loud”. I was going nuts. Honestly. The venue was pretty small, and most of the crowd were clearly underaged people (or at least they looked really young from my old-age vantage point), and I was pretty much the first person just going nuts because hell, Liam and Me are my fave band, and they were just THAT GOOD. I was jumping around, singing along, and clearly far too excited. haha Out of the whole set there was just one song that I wasn’t familiar with, but they did play Pretender which I also really like, and of course Pretty Black Dress. This is similar to my Abercrombie Overload post back in March/April, but seriously, I had WAY too much Ikea this weekend! Yesterday I spent a full 8 hours at the new-ish Ikea in Red Hook, Brooklyn, figuring out what closets, lamps, pillows, kitchen-stuff etc to get with my roomie. I seriously hate that stupid Self Serve section, yanking out boxes weighing 100lbs really isn’t eashy, especially when they contain 90″ frames/doors – I literally had to lean over the cart, pushing it with my stomach and steering it using the handles with my hands with my lovely behind sticking out – it was a sight to see, honestly. I was so exhausted by the end of it that I could barely think, and my legs and feet were seriously aching. I was meant to go out last night but that definitely didn’t happen – I got back to Lo’s around 11.30 (12 hours after I left, no exaggeration), sat down and couldn’t get up for at least 10 minutes then hauled my behind into the shower. The worst part? I have to go back. They were out of stock of one of the wardrobes I was getting, plus the clothes rail, plus the drawers, so I have to go back. I’m already seriously dreading it. Plus, I also have to pay the $90 delivery fee AGAIN. It’s ridiculous!! They better have everything I need when I go back!!! Our stuff was delivered today and my cousin came over to help us assemble it (bless him!! ), so we assembled 2 wardrobes (mine) and a chest of drawers (hers, and with Lo’s help as well since she came by later). I just have to assemble the last wardrobe, my bed frame, and my headboard next, not to mention my desk/vanity once I find one that I want, if I can. Oh Lordy. Good thing Lo has tools…especially the electric screwdriver! I’ve been having such good food the last few days – Saturday was Grissini (scroll down for Grissini info) at the Grand Hyatt, where I had a seriously melt-in-your mouth delightful beef carpaccio w/rocket (or arugula, depending what country you’re from) and slivers of parmesan, and for my entree had a pesto lasagne. I’m not normally a huge fan of lasagne, but I do love pesto, and this one came in a little clay dish, and each layer was thin and delicate, piping hot and just totally scrumptious, for lack of a better word! I shared the tiramisu for dessert but it was only ok, too creamy for me personally. Sunday dinner was at Spoon at the Intercontinental (where that weird spork is from in the photo above), and I had the duck foie gras with this ginger sauce and a herb salad that came on the side. It was SO GOOD. I don’t even like ginger, but the sauce was delish with the foie gras, and it was quite a large piece and 2/3rds of the way through I had to pause because I felt like I was gonna have a heart attack. Entree was the shell pasta with ham and truffle in some sort of cream sauce, which was also really good (I love truffles, and I love cream sauce for pastas), but not exactly spectacular (then again, how spectacular can pasta really be?). On a totally different note, the lil sis, my parents, and my grandma are all arriving later today! As fun as it was having the apt to myself, I’m excited for everyone to get back. I’m sure home will be really very noisy (lil sis has a tendency to sing and dance around the house, or my dad will be chasing her around the furniture as she runs away squealing “SAVE ME! SAVE ME!” lol) but it’s gonna be so much fun. 🙂 I love my fam! The Olsen twins are in town to launch their line, Elizabeth and James, at Lane Crawford (HK’s answer to Barney’s/Bergdorf’s/Neiman Marcus), and last night was the launch. There were so many little girls who arrived with their mothers, and that was pretty cute. I saw one ten year old clutching a hardcover biography of MK+A, aww! haha Not many ‘young Hollywood’ celebrities come to Hong Kong, at least not those admired by tweens and who regularly feature in Teen Vogue. I had a bit too much champagne (empty stomach, mind you) and saw a lot of people, which was fun. I didn’t follow the crowd taking pictures, though caught a few glimpses of them traipsing from one end of the venue to the other so that people could take their pictures. One friend said she tried on a dress earlier that was selling for $6000 Hong Kong (roughly US$750), and was made of cotton. Then we laughed and said that we could probably make something like that ourselves with a dress from H&M, scissors, and a sewing machine, and we’re not exactly skilled clothes-makers. (Far from it, really.) The collection is kind of cute, but way overpriced. Maybe they just wanted to prove that they can make more than just Wal-Mart-worthy clothes? Our reservation was for 8pm on Friday, and it wasn’t that busy when we got there, though tables quickly filled up and the restaurant definitely got noisier as time went on (the music got louder, too, to a point where you either had to be sitting very close to the person/people you are dining with to hear them, or you have to raise your voice to be heard – my only real complaint). Our table was in the corner of a booth, shared by three tables total, which was a pretty intimate and romantic setting. Lighting was low (so low that we had to move the candle closer to be able to read the menus! 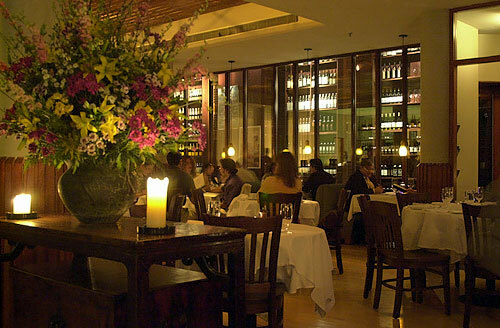 ), but that also gave the restaurant more ambiance. For starters, K ordered the Beet and Watercress Salad with hazelnut vinaigrette, goat cheese and chive mousse, and toasted walnuts, and gave me some to try. I’ve never really eaten beets, but this salad was really good (thinking about it now has my mouth watering! ), with both red and yellow beets. All the flavours complemented perfectly (I know that sounds pretentious, especially since I’m no food critic, but that’s the only way I know how to describe it! 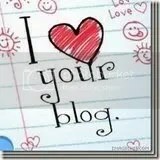 ), and I highly recommend it. For my main I ordered the Dylan Beef Wellington with portobello mushroom and foie gras sauce, which was really really good. Beef wellington is basically steak with pastry around it, this one came with a filet mignon wrapped in puff pastry – delish! The beef was tender and not too chewy (hate chewy beef), but the sauce was slightly too salty for my liking. Still, it was mouth-wateringly good. Ok, so I had passed the Abercrombie flagship on 5th Ave a few times this trip, and there was always a huge line outside so I never bothered. (Sidenote: it’s ridiculous that people actually line up for ABERCROMBIE! I mean come on…in Asia people only line up for Louis Vuitton, Prada, Gucci, and the like…not Abercrombie!) But since today was my last day and I was in the area, plus my friend requested that I buy him a polo and I needed denim shorts, I checked it out. Luckily at the time I went there was no line, but there was still a ridiculous amount of people in the store. The music is pounding as you walk in, and the lighting is so dark that it actually makes it somewhat difficult to see things, which, you know, might make it somewhat hard to shop! The worst wasn’t even the music and the lighting, but the smell of the Abercrombie perfumes – it was so overpowering I could actually taste it in my mouth and for the next 5 blocks I walked after I left. I had to wait in line for about 10 minutes for a changing room (at least), but there was pretty much no line for the cashiers on the 2nd floor, so that wasn’t too bad. Still, by the end I really couldn’t wait to just get out of there. I overheard a mother saying to her daughter that she couldn’t stand it in there, and I had to agree. The only reason I even bothered trying on the shorts was cause if I didn’t, I didn’t want to have to go back to return them!! I am absolutely in love with this show! It was so good – all the songs and dancing and the stage sets and costumes were gorgeous and outrageous and beautiful, and the transitions from sea to land or vice versa were clever, and the new songs were good as well. I cannot say enough good things about this show, except that everyone should go see it if they get the chance! The songs were performed brilliantly – they all made me feel what they were meant to! Wistful & dreamy in “Part of Your World” (my fave Little Mermaid song, btw), grinning in the chef’s song about the fish, and Under the Sea’s set was stunning, with all the fish on stage and in different things made to look like they were floating. 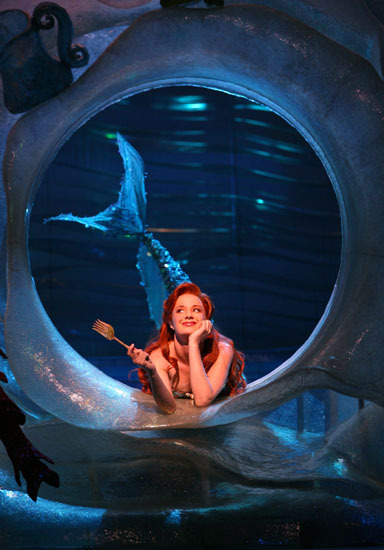 Sierra Boggess as Ariel kinda reminded me of Amy Adams in Enchanted – maybe it was the long red hair, but the way she was so innocent about things and singing all the time just made me think of it! She was great though – I was kind of worried that she might over-sing Part of Your World (eg. at the Oscars when “That’s How You Know” from Enchanted was performed – I still shudder – it wasn’t meant to be opera-like! ), but she did a fabulous job. I thought it was quite amusing (and kinda cool) that Triton’s family was multi-racial – there were caucasian mermaids, african american mermaids, and I even spotted an asian one and they’re all a family! In a haiku sort of mood.